In part 2, we covered how to set elevations and manage drainage for this project. 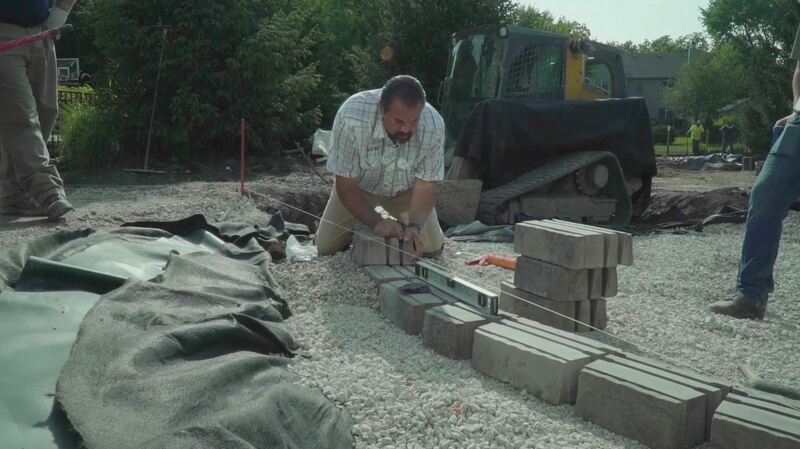 Now let's take a look at building a set of steps using our Prescott wall blocks. Building a retaining wall or in this case a set of steps inside of a rain harvesting system might sound complicated, but it's rather simple. 1) Extend the base adequately beyond the heel and toe of the block. It should always extend by at least the equivalent of the base thickness. 2) The base needs to be minimum 6 inches thick. Therefore, we need an extension of 6 inches both in front and behind the first course of block. 3) The embedment of the wall needs to be either one full course of the tallest unit or the equivalent of 10% of the wall height, whichever is greater. So, 6 inches beyond the heel, 6 inches beyond the toe, and min. 6 inches thick. We also had a 6-inches embedment. STEP 1: Lay the first course of blocks. STEP 2: Embed and taper fill the units of the first course with clean stone. STEP 3: Apply adhesive. Make sure to apply it on a clean surface. STEP 4: Set unit in place. 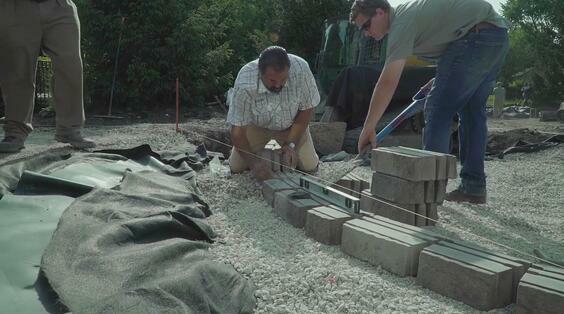 STEP 5: Drop the patented Techo-Bloc alignment bars into the block to get a proper alignment. These bars are free and come with the blocks. An independent mechanical device and sheer strength provide our interlock. We are also laying the blocks in a broken bond pattern. STEP 6: Core and taper fill.